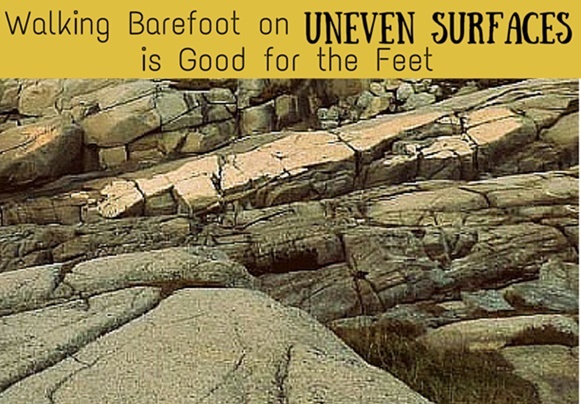 Walking barefoot, especially while outdoors on an uneven surface, results in less foot discomfort over time. Why? Because this sensory activity is important for your feet of every age, because stimulating the proprioceptors is the gateway to build stronger intrinsic foot muscles. Walking barefoot on an uneven surface improves symptoms of plantar fasciitis by increasing activation of the intrinsic musculature of the foot. Many newbie minimalist runners and barefoot runners experience plantar fasciitis which is a result of weakened arches from long-term wear of motion control, cushioned running shoes. However, walking barefoot on an uneven surface improves symptoms of plantar fasciitis by increasing activation of the intrinsic musculature of the foot which in turn, strengthens the muscles of the arch. Running has a bad reputation for being a high-impact sport as injury rates in recreational runners remains consistently high even though ‘footwear technology’ has come a long way. However, the conventional running shoe with arch support, flared heels, and medial posted insoles virtually destroys the foot’s sensory functionality over time. For instance, experts highly speculate that excessive cushioned running shoes are responsible for plantar fasciitis because the protective material of the shoe depresses muscle activation in the arch. Robbins and Hanna (1987) reasoned that the human foot is mistaken as an unusually fragile structure unable to sustain the use associated with running without injury and is why protective athletic footwear is needed. The human foot cannot be that fragile as it has many diverse functions. For instance, in barefoot conditions, the feet control dynamic balance, unloading and loading elastic energy in the arch and plantar pressure dissipation to help reduce loading on the lower leg. Even more compelling, plantar fasciitis which is common in North American populations, is a rarity in traditionally barefoot populations such as Ethiopia. It has become more than obvious that barefoot conditions preserves foot health. Unfortunately, many recreational runners are not entirely convinced that going barefoot is the cure-all for running injuries. Yet, most running injuries are a direct result of weakened feet from cushioned shoes. The good news is to improve foot strength, a shod runner doesn’t need to become a barefoot runner permanently, but rather walking barefoot on uneven surfaces is more than enough to ward off painful conditions like plantar fasciitis. Walking barefoot outdoors on uneven terrain was found to increase activation of the intrinsic musculature of the foot which in turn, improved medial arch rising and shortening. This adaptation strengthens the muscles of the arch to allow for dynamic impact damping and minimizes loading on the plantar fascia during running. Start off by walking barefoot outdoors on grass 30 minutes every other day and gradually increase this activity to match your comfort level. If you are unable to go barefoot outdoors, increase your barefoot activity indoors, especially during weight-bearing activities. Avoid wearing socks because wearing socks is the same as wearing gloves on your hands and limits proprioceptive feedback needed to stimulate muscle activation. Always remember the feet are highly adaptable and are stronger than you think! The more time you spend barefoot, the more injury resistant your feet will be. Click here to find out more benefits of going barefoot. Dont like the idea of going barefoot outside? Check out these barefoot inspired running shoes –they are still amazing sensory stimulators for the feet! Robbins, SE and Hanna, AM. Running-related injury prevention through barefoot adaptations. Med Sci Sports Exerc, 1987; 19(2): 148-156.